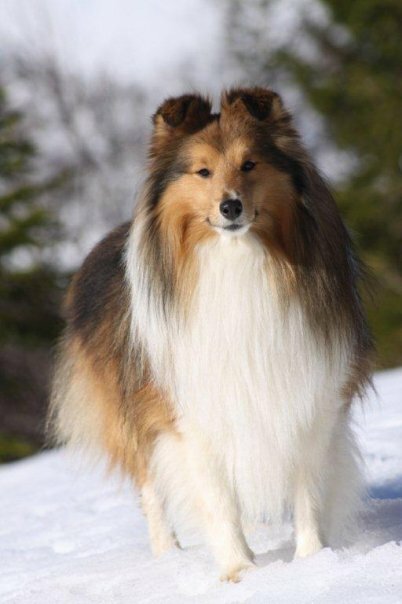 Welcome to Chesslike, a Shetland Sheepdog breeder located in Ålesund, Norway. Through the years we have bred Shetland Sheepdogs under three different prefixes: Smashing, Playtime and Chesslike. The kennel Chesslike was created by mother and daughter in 2005, basing itself in large part on the offspring of our late Playtime’s Made in Paris (Chess). We mainly breed sable shelties, and they are all based on British lines. Our dogs are bred in adherence to the FCI standard with the hopes of being of high enough quality to have success in the ring. However, we consider showing our dogs as a hobby rather than a strict goal. If buyers are interested in showing their dog, this is highly encouraged - where we occasionally provide ring training events with the local sheltie community, as well as being able to take the buyers with us to actual shows to show them the ropes. These events are meant to be social and fun, where good results are simply a bonus. We breed on a limited scale (only a few litters a year), where we aim for quality above quantity, striving for shelties of British type with beautiful expressions, solid construction, good health and family friendly dispositions. We rely on statistics, experience and weekly photography from birth to determine the potential of a puppy. The most promising puppies are generally sold on breeding terms. For more information in Norwegian, see our contact page. While we have a couple of available stud dogs in the area, we are currently looking to improve our selection over the coming year. Selecting the correct mate can often be challenging, as this choice should take several points into consideration. One should always be attempting to balance core features between the male and the female, while also considering coat color and genetics, health, height, physical construction, facial expression and historical lineage. If interested in a second opinion, don’t hesitate to ask. We are very much into photography, where it plays a core role in logging the development of our dogs. We often take photos of other shetland sheepdogs from various shows, community meetups and local litters - as well as an abundance of horse riding and nature. On occasion, we also host local photo shoots for those that want photos taken of their dogs. The history behind the breed and its development since its inception from the early 1900s is one we value greatly. Having collected old books, magazines, photos and pedigrees for years, we own a large amount of sheltie history that we wish to both preserve, build upon and share with others. Reidun is currently the historical archivist for NSSK (Norwegian Shetland Sheepdog Club), having always had a fascination with the breed’s historical content. If you have a personal interest in this topic, feel free to contact us. In order to contribute to the history of the sheltie, we have written a large range of articles and guides throughout the years - based on historical texts, own experiences and the expertise shared by fellow breeders. We hope to soon upgrade our literature section with a considerable selection of these articles, in order to provide those interested with added information about the breed. Norwegian versions of some of these articles are currently available in past editions of NSSK magazines. All photography and content is created and owned by Chesslike unless otherwise specified. To use or distribute this content, please contact us.